We investigate the stability of the coupled soliton solutions of a two-component Z(2) vector fieldmodel, in contraposition to similar solutions of a Z(2)×Z(2)model recently introduced. 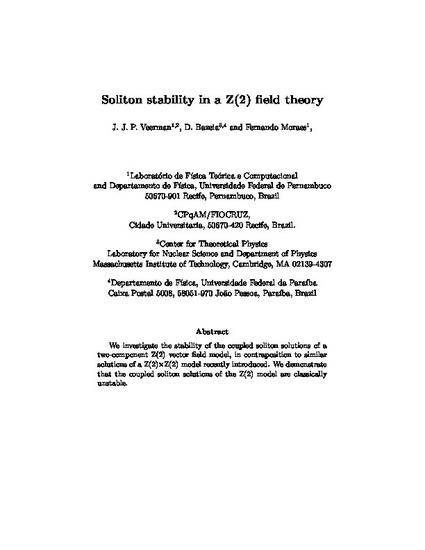 We demonstrate that the coupled soliton solutions of the Z(2) model are classically unstable. This is the author’s version of a work that was accepted for publication in Journal of Mathematical Physics. Changes resulting from the publishing process, such as peer review, editing, corrections, structural formatting, and other quality control mechanisms may not be reflected in this document. Changes may have been made to this work since it was submitted for publication.